Play poker, learn typography with the font deck! Save 25%! > That’s right. A premium deck of playing cards that teaches you typography. 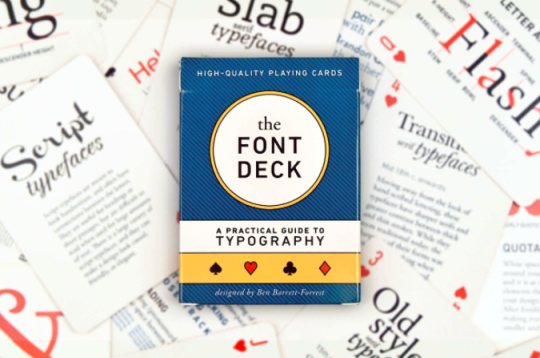 The font deck condenses hundreds of pages of design handbooks into a stylish and functional casino grade deck of playing cards that is as good for memorizing the finer points of font design as it is a game of cribbage or poker. Brush up on your font cred in a fun way! Give it as a gift to all the creative workers in your life, or use it to educate a client about font choice (and why they should avoid Papyrus and Comic Sans)! The Deck Font sells for $20, but for a few more days you can save 25%. This item ships worldwide — order now in time for the holidays, or, I don’t know, the office Christmas party you were invited to for some reason and for which you need to bring a gift!